. @RUBird7 @GreggDoyelCBS amazing that a chance to play games tonight could be considered an insult. I'm honored to be in studio watching. Albany has actually played a quicker pace than usual. Gotta be careful. Albany started this game on a 21-2 run. Looking bad early for Mt. St. Mary's but remember, they will shoot a ton of threes. When they make a few, the tide can turn quickly. Remember, @Mateen_Cleaves is answering all of your #MarchMadness questions. Send them in using #AskMateen . 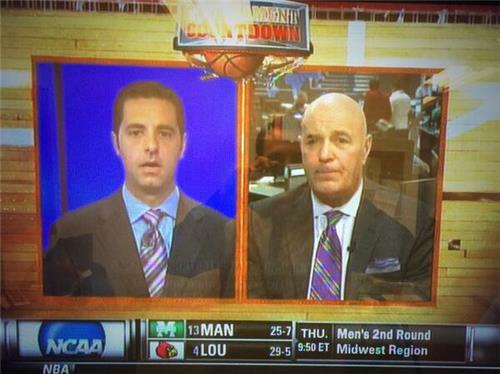 The 2014 NCAA Tournament is underway on truTV. This theme will recur in the tourney: One team (Albany) wants to walk, the other (Mt. St. Mary's) wants to run. Win the style, win the game. Since First Four began in 2011, the winners of the Tuesday games are 0-3 in their Round of 64 games. On truTV @sethdavishoops on @MountHoops ' high-powered offense: "A lot of threes and not much D." Mountaineers take on @UAlbany at 6:40p/e! My first turnover of the tournament. Won't be the last! RT @Chaser_ATL : Nacogdoches, TEXAS! not Louisiana!